People often ask `what exactly do you do in Iraq`! Probably the best thing to do would be to do a quick summary of a typical 24 hour period. The morning starts with two Assyrian women at the door of the Church facility asking for urgent help. The son has been arrested by the Americans mistakenly and has been in prison for three months. He was simply a the wrong place at the wrong time can we help? We sit down with the Priest and discuss the situation. Track down what prison they are in and begin the process of making the necessary arrangements with the US officials to get the son out of prison. We pause and pray together that God will help us. Then back to the Convention Center which houses part of the US Administration to get information on other Jobs for the Assyrians and to get information to help the missing. `OK, ok. Don`t worry. We will!` he replies. Another trip to the airport, this time taking two Assyrian women to apply for new jobs through one of our friends at the airport. We go through the interview. One is hired on the spot - for $600 a month - over ten times her current salary and enough to support a family and more and the other a job in a week. A quick check to see that our security is ok, the machine gun and pistol in place, our telephones working and back to work again. Interviews with Assyrians getting down their condemnation of the change in the Civil Registration Law replacing the secular system with an Islamic one and their opinions on different topics. Then a series of interviews with Iraqis asking them what they think of a muslim constitution for use by Foxnews and CNN. They all say regardless of whether they are Shia, Sunni or nothing that they do not want an islamic constitution. A quick stop to see our friends at the CNN Bureau to pick up some previous tapes, a visit to a Japanese News Network. The guy at Foxnews laughs and says `Ok, I have to mention the Assyrians, right? Got it!! Get out of here! And it is a day! 24 hours a day working to help meet the daily needs of the Assyrians in Iraq and fighting not for a compromise but for victory that results in for now, a secular constitution, autonomy in Nineveh and Dohuk provinces, elections with special rights for Assyrians and no turnover of Government until that is accomplished and after the dust has settled - a nation of our own - Assyria, Independent, free and strong! Not begging for crumbs off the tables of the muslims or hoping agains hope that something good will happen but working 24 hours a day for three things - the daily needs of the Assyrians, jobs so they can support their families and fighting, not negotiating, talking, hoping but FIGHTING with the authorities demanding - not negotiating, talking, hoping but DEMANDING that the minimal rights of the Assyrians be given . . . or else. Tough? Yup! Worth it? Double Yup! Since when were the Assyrians quiet, obedient and settled for the crumbs off the table! Not these! We are not nice, able to be entreated nor rational when it comes to the demands and will never, never, never settle for anything less than the simple, clear and easy to understand demands that we make. Some may serve parties, some governments others organizations but we serve God and hold His power in one hand and His promises in the other! At the end of the day, curled up in a nice, warm, Assyrian bed after a dinner of Assyrian Chicken and rice suddenly the room is especially warm, the tears start to trickle down the cheeks and somebody is clearly in the room. You cant see Him, you usually miss his presence but once in a while you truly know He is there. His quiet voice says the one thing that makes it all worthwhile. `Good job`. And then quietly in the sweet presence of Jesus sleep comes! These days it is hard to find an Assyrian Hero. For whatever the reasons precious few have risen to the challenge of a millennium, the best chance to achieve what has always only been a dream - a country of our own. One of the favorite movies of the Assyrians in Iraq - I saw it the other night on Ashur TV complete with Arabic Subtitles is the movie Braveheart. For those who have seen the movie the question is always `Where is William!`. William was the hero of the story which is of the fight for independence of Scotland . William gives his life for the independence of his country ending it moments before his death by shouting `Freedom`! The other protagonist is Robert, the always compromising, always cautious Noble Lord. In the end, though because of Williams example of courage he changes and stands up for once in his life and leads his people to freedom. One line in the movie stays with you for life. `Men dont follow title - they follow courage!`. If there ever was someone who exemplifies that phrase it is Mar Gewargis Sliwa. Unassuming when you meet him, he is in fact a quiet `William`! During the terrible reign of Sadaam he staunchly refused any mention of the Dictator in his services even as others considered this normal. He constantly fought the fine line of working with and not giving in to for his people, carefully negotiating agreements to keep the Churches free, print Bibles and Books and run the schools. A huge achievement under such terrible conditions. I first met Mar Gewargis years ago in the US and we began a long correspondence concerning our mutual interest in the great exploits of The Assyrian Church of the East in China , Japan and throughout Asia . Over the years we shared the excitement of new discoveries of the Church in China and Japan and one of the daily nightmares of my life was having to look at a passionate fax from Mar Gewargis to hurry and come to Baghdad so we could continue our work on the Church in Asia. The war stopped all that and I finally made it to Baghdad weeks before the beginning of the war. I found a strong, uncompressing Mar Gewargis with a staff that was equally so. Many begged Mar Gewargis to leave before the war. While many did, he was uncompromising in his clear desire to stay. I remember him saying `I must stay with my people. They need me.`. Even as the war became closer and closer he did not change his position and stayed in central Baghdad fearless in the fact of the attack and final fall of the city. When I returned days after the war having left with the United Nations on the last day, this time with a truckload of supplies there he was with a chipper `Why didnt you call! What are we going to do with 20 tons of water and supplies! You could have at least called` he said with a smile! We all laughed! The telephones still do not work! I found an equally defiant Mar Gewargis, none the worse for the wear now in a position to lead his people in the new situation. Just as he had been uncompromising in the face of the all powerful Sadaam he was and is equally so towards the Americans, the Chaldeans or anyone that stands in the way of the freedom of the Assyrian people. These days, Mar Gewargis runs a very tight schedule with meetings with various leaders, performing the duties of the Church at all hours of the day and night and teaching his people that courage counts. The other day we couldnt see him because a delegation of Muslim Mullahs were there to pay their respects. Problems? There are many. Much like happened following the fall of Communism in Russia there is a growth in many new Churches in Iraq who take the easy way out in building their churches and instead of making new converts as they are biblically supposed to, they `steal` them from the Church of the East. Mar Gewargis answer? Just keep going! 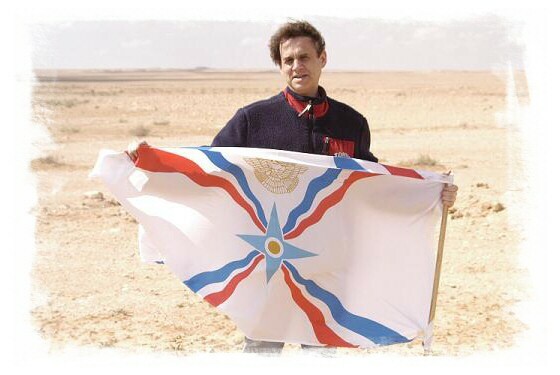 In a time when the Assyrian Nation desperately needs heroes, there is one! Quiet, humble but with the fire of God on him - Mar Gewargis Sliwa, Archbishop of Iraq, The Church of the East! Mel Gibson in the Movie Braveheart has his hero `William Wallace say `Men don't follow Title; they follow Courage`. Once in a great while God puts the two together and you have a man with both title and courage! Mar Gewargis, all his priests scattered throughout Iraq and the precious Assyrians here in Iraq deserve our prayers and support. Thank you, God for Mar Gewargis! Give him even more courage and may he be one to lead our people to independence! US Taxpayer Funded TV Station Propagates Islam! You would think it was Sunday Morning! It is 11:00 and the Televangelist is preaching. Today`s topic - `Repent of Your Sins!`. Reading from scripture, the text he is speaking from flashes across the screen, followed by a dramatization of the scripture passage, complete with period costumes and sets involving well known actors. The `Televangelist` comes back on the screen and begins to preach, scripture in hand with all the `hell and brimstone` fervor of a Southern preacher. Sunday morning TV in America ? No the name of the program is `Morals And Islam` and it is on Al Iraquia - the American Taxpayer funded Television Network in Iraq . Following that is the five time daily `Call To Prayer` featuring footage from the Grand Mosque in Mecca urging all Iraqis to pray! Shortly after this is the next program entitled `The Good Names of God` - another high pitched, sing song chant of `Allah is the one, the good, the powerful, the forgiver etc. etc` accompanied by unusual video - the faithful filing the mosque! Following this another islamic televangelist reads the koran and name by name begins to offer commentary on the various names of Allah - again at American taxpayers expense! `As Christians, it is particularly difficult for us because the message it gives is that even the Americans are supporting an islamic government in Iraq . What can we do? We are deeply disappointed and angry, but also afraid for our future. We feel as if one dictatorship will now be replaced by another - this time islamic which will be eve worse for all Iraqis and in particular for Christians..
As if that was not bad enough, the five time daily `Call To Prayer`, one of the key factors in the intimidation of the people is broadcast. Sitting in a house in downtown Baghdad it comes in stereo - one side from the Television and the other from the local mosques massive speakers blaring outside. Five times a day words from the Koran flash across the screen in a clear message to a public yearning to be free from intimidation that one form of totalitarian government is slowly replacing another. Ask an Iraqi and you will find near unaninimity on one very crucial point - they are adamant that they do not want to become an Islamic state like neighboring Iran . This is where the crux of the problem lies. There is a grave lack of understanding of what is lumped together as `islam`. In clear violation of the Koran which teaches `Religion shall not under compulsion` the whole notion of `islam` is a myth perpetuated by those simply using it to stay in power. The reality is very different on the ground. Simply put what is referred to as `islam` collectively is simply a system kept in place by intimidation and the use of `islam` as a cover. In a little known `dark side` of the whole operation is the power of what is nothing less than a police state. A quick check around at one of the five time daily `Calls to prayer` and you will find two, three people pausing to pray, near empty mosques and with a few exceptions literally nobody doing it all. The five `Pillars` of islam that define a persons faith - the five times daily prayer, giving to the needy, the month of fasting, the once in a lifetime trip to Mecca are near completely ignored. Ramadan the month of supposed fasting is the one time of the year when people party and ironically gain weight as they are not allowed to eat during the day so compensate by overeating after dark. Ask Ali Hussein, 56, if he prayed today. His answer a confident `no`. `Do you ever pray`. Again `Maybe two or three times a year`. Once born into a `muslim` family one`s religion is put on an identity card, passport or other registration and may not be changed. Even more unbelievably only three religions are allowed - islam, Christianity and Judaism - believing in Buddhism, Hinduism, any other religion or nothing is not allowed by government fiat. Denying the most basic of human freedoms - the freedom of thought an belief so called `islamic` countries force those under their control to live double lives. Since they are not legally allowed to change their registration from `muslim` to the reality which would be `none` for most people create double lives - the public life and the private one of who they really are. People bring up the case of Saad, born to a Christian mother and Muslim father. The father left the family and the son, raised a Christian in secret has to come to church and practice his faith in fear because born in a muslim family he is not allowed by law to change from a religion he never accepted in the first place. The totalitarian state even involves itself in the daily lives of the citizens and in a major step backward the Civil Registration Law in Iraq which since 1958 had been completely secular was recently overturned by the US appointed Iraqi Governing Council and replaced by the much feared islamic Sharia law which makes all laws subject to the Koran. The one lone buddhist in Iraq sends frantic email messages `Help me. I am afraid for my life. As the only buddhist in the country as far as I know I am in constant hiding. Can you help me get out of the country. Is it not time for the community of nations to recognize `islam` for what it is. A totalitarian political system that is used to abuse, intimidate and enslave millions of people worldwide? Is it not time to call the bluff and demand that it stop. A first major step? Stop funding it with American Tax dollars in Iraq . An incredible irony - while in the US the Ten Commencements is not allowed on public property American taxpayers fund Islami Televangelists in Iraq . The time has come to say `the buck stops here` to the totalitarian political system that uses the name of `islam` as a cover to keep power in the hands of `thugs` and return it to the poor people suffering under its control. If freedom is good enough for Americans it should be good enough for Iraqis, Iranians, Syrians and a host of other peoples living in `islamic` totalitarianism. `We just want to be normal. We just want a chance for normal, civilized lives. Our faith and religion should be private and free. We want religion out of government!` says `Shia muslim` `Mustafa Sadaam 23. After 35 years of the terror and intimidation of Sadaam and various predecessors the Iraqi people should not have another totalitarian state forced on them this time funded by the American taxpayer. A Governing Council funded by American Taxpayers overturning secular law and replacing it with the much feared sharia law! A Television Network and islamic televangelists funded, again by American Taxpayers proselytizing for Islam? Enough is enough! Worldwide Day of Prayer for Persecuted Church in Iraq! The Assyrian Christian Community - the oldest Christian community in the world - is putting out a call to the worldwide Christian community for a day of prayer and fasting to beseech God to intervene on behalf of the community in Iraq . The Assyrian Christians are the indigenous or original people of Iraq . They were the people Jonah came to in Nineveh (Present day Mosul), the first people to accept Christianity following the death of Christ and the greatest missionary sending people in history bringing the Gospel first to China, Japan and India and all of the east! Civil Law – The Secular Civil Law was replaced with Muslim Law – pray that this will overturned! This law regulates the daily life of all Iraqis! February 28 – A seriously flawed, Muslim temporary constitution is scheduled to be announced on February 28. Pray for its defeat! July 1 – Immediate repeal of the July 1 handover. If this premature handover goes forward there will be civil war and a massacre of the Christians. Constitution – A secular constitution with a bill of rights and no religion or ideology as demanded by the Iraqi Constitutional Committee. The community is asking for special prayer for the above that God will intervene on their behalf and the oldest Christian community in the world and the Community with the largest sending of missionaries in history be preserved and allowed o live in peace and freedom after long persecution. • July 1 handover stopped – It is the conclusion of the community that the July 1 handover of power is to early and is in agreement with analysis privately of both he Coalition Provisional Authority and the Goernmegin Council that it will reaulst in Civil War and the massacre of the Christian community with word of such lists already being prepared. • Secular Constitution – There must be in place a secular constitution which the Constitutional Committee has recommended shall contain no words relating to any religion, idealogy, fair and free electons based on this constitution, seated government – only then can there be a handover of sovertignity. Civil War , Iraq and the Election! The Al Jaiha Ice Cream Parlor in Baghdad is booming! The TV Monitors blare Egyptian Music Videos while a line is developing at the counter for the house favorite - a huge Ice Cream Sundae and customers are talking at a steady buzz! The news from Baghdad is bombing, terror and all bad these days but one must be careful to make a distinction. For the foreign journalist, soldier and others targeted by the non-Iraqi terrorists who are determined to block any progress in Iraq it may be dangerous. But for the average Iraqi hope is in the air! The two William sisters - Vinos 23 and Florence 21, the two Lazar brothers - Remon and Simon, 25 and 21 and Robert George, 25 are digging in. To the question `how does Al Jaiha compare to when Sadaam was in power` thy are quick to respond. `When Sadaam was in power we would be watching one of the three Sadaam TV Channels with him on TV or some old, boring black and white movie. Nobody would be talking freely and we would quietly eat and leave`. says Remon. `We lived in constant fear` continues Robert George. `You never knew when someone would be taken away for saying the wrong thing. It was a constant state of low level terror` he continues as he shares the story of his dear friend, Amir who was imprisoned for 3 years for simply trying to assert he was an Assyrian and promote the use of the language of the indigenous people.`. The Al Jaiha Ice Cream Parlor is a good barometer of how things are in Iraq . Ignored by the international media who for some reason, at least according to the regular Iraqi have a bias towards any good news from Iraq , Iraq is doing just fine, thank you! Ice Cream is not exactly a staple, and when people have enough extra money and hope to be packing out the Ice Cream Parlor on a Sunday night things must not be too bad. A quick look outside the window shows the real problem in Baghdad these days - massive, hour long traffic jams, crammed stores overflowing with everything imaginable for the Iraqis finally freed from decade long pariah status. Prices are booming and the value of the Iraqi dinar is rising. A house that would go for 30,000 $ months ago is nearing $100,000. The Iraqi dinar which before the war fluctuated in the 2500 to 3,000 to the dollar range is now nearing 1200. For the average Iraqi it is the best of times. Something they never even dreamed of..
27 year old Weena Aref, a Kurd agrees. She is the manager of an Internet Shop. `Business is booming. On a recent afternoon all the terminals were occupied with paying customers paying $3 to get online! `The best part is that we no longer live in terror! We do not fear somebody taken away` she says, echoing other Iraqis. The `bad`? It is the deep, palpable, undercurrent of fear that is gnawing at everybody, although few will speak of it. It is the planned July 1 handover of power in Iraq . While the original plan was to as in Japan and Germany, have a constitution, elections and a government in place, due, the Iraqis say to fears of the impact of Iraq on the upcoming US Presidential election the schedule was suddenly changed. `If the current plan goes forward there will be civil war in Iraq beginning on July 1` says an American official asking to be anonymous. `I have been told privately by both senior officials of the Coalition Provisional Authority as well as the Iraqi Governing Council this. In addition, the airport will close as no airline will fly into an airport without a government in charge` he continues. `I do not understand why the United States, the champion of freedom and democracy wants to leave Iraq before her job is finished - before a secular constitution, elections, government and local autonomy are in place and risk undoing all the good she has done in liberating Iraq` says Hekmat Hakem, a member of the Constitutional Committee charged with drafting Iraq's constitution. A trip south shows the reality on the ground. Town after town in southern Iraq does not fly the Iraqi flag over government buildings, but the green flag of Sistani, the Iranian leader of the Shiites. `Why does the American Government talk to this man`. Robert George continues. `He is not even an Iraqi - he is an Iranian. The Americans should simply say that only Iraqis can have a say in the future of Iraq and send him back to Iran where he came from.`. Few in the rest of the world seem to realize this little known fact - the main source of trouble to the US authorities is in fact not an Iraqi but an Iranian. Sunni Muslim, Ahmed Tarik, 23, joins in `We just want to be left alone. Sadaam was terrible, but becoming like Iran would be worse.`. As the July 1 date nears a sense of doom is quietly growing underneath the outward sense of optimism, hope and joy that one sees everyday living outside the elite hotels where the foreign journalists are. It took the United States seven years to move Japan from a police state to a free and democratic society. The outbreak of civil war on July 1 would seem to even the most casual observer to have a far greater negative impact on the November elections than the improving situation in Iraq . For a first hand look, the Al Jaha Ice Cream Parlor is living testimony to the fact that the war was worth it, that good times are truly around the corner and the worst possible thing for Iraq would be a premature handover of power. Will there be the political will and the commitment to the values that launched `Operation Iraqi Freedom` in the first place or will as happened in China over 50 years ago the question `Who Lost Iraq` be the buzzword of the 2004 election? The next few weeks may very well decide the fate not only of Iraq but of January 2005!